As part of My Beauty, Skincare and Body Resolutions I said that I will use a sunscreen on a daily basis. I wanted to start investing and taking care of my skin as I've read articles on how much harmful sun rays can damage the skin as one gets older. Now that I am on my 20's I want to make my routines habits that will be very hard to break. I am now a believer that sunscren is the most important beauty kit that one could ever have. It helps keep UVA and UVB from damaging the skin. Overexposure to sun also cause sunburn, faster aging of the skin and even skin cancer and the only prevention is the use of a trust-worthy sunscreen. Today I will be discussing my current skincare obsession. I use it every single day and I can't get enough of the effects it gave to my face ever since. 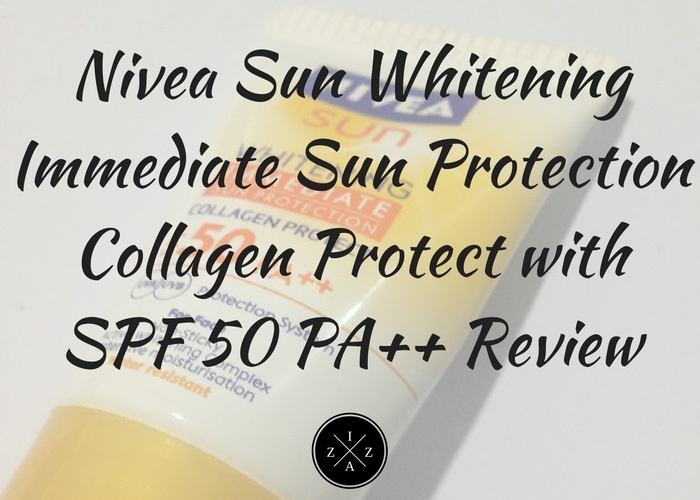 I am talking of Nivea Sun Whitening Immediate Sun Protection Collagen Protect with SPF 50 PA++. A non-sticky with active whitening complex and intensive moisturization water resistant sun screen for face. It also UVA and UVB Protection System perfect for the summer heat. Nivea Sun Whitening Immediate Sun Protection Collagen Protect with SPF 50 PA++ is an effective protection against sunburn and premature skin ageing. Protects immediately upon application, no need to wait for 20 minutes to set. The formula is with licorice extract that reduces skin's pigmentation at its source to effectively lighten the skin. It reduces melanin production responsible for dark and uneven skin tone. The Advanced Collagen Protect is responsible in protecting the skin's collagen to help prevent wrinkles caused by frequent sun exposure. It is available for 144pesos 15ml size of product and I availed a bigger size during the Nivea 50% Off Sale for just 218pesos 120ml super sulit and happiness overload! Since this is the first time that I am implementing a sunscreen on my skincare routine I researched on when and how to use it for better result. Apply sunscreen approximately 30mins before being on the sun though this product has immediate effect that you don't have to wait that long. Remember to reapply after swimming, pro long sun exposure and streneous exercise. Apply sunscreen often throughout the day especially if you work outdoors. Nivea has been my most trusted brand when it comes to skincare. I had tried and tested their products from lotion, mud foam, moisturizing cream and lip butter. I purchased the product with full confidence that though it is pricey it will give me a favorable effect. When I saw the tiny product in Watson's stand I knew I have to purchase it. It doesn't only protect my skin from the sun but it also whitens and gives collagen protection. It is a 3in1 product that is easy to use and doesn't require much time to take effect. The no waiting time is perfect for on the go like me because I am always in a hurry. It also keeps my skin moisturized all throughout the day and doesn't feel sticky at all. It has a light feeling on the skin and the creamy consistency is easy to blend. After almost a month of using the product I am a testament of its great effect. My skin feels clear, my makeup stays longer and it evens out my skin tone. With all the great effects and features, Nivea Sun Whitening Immediate Sun Protection Collagen Protect SPF 50++ has been the been the best deal ever. The 15ml product can last a month depending on how often how much you use. It is compact, easy to slide on the bag and just a proof that one can never underestimate the "little things" in life. Buy it!!! Try it!!! And let me know your experience in the comment section below!